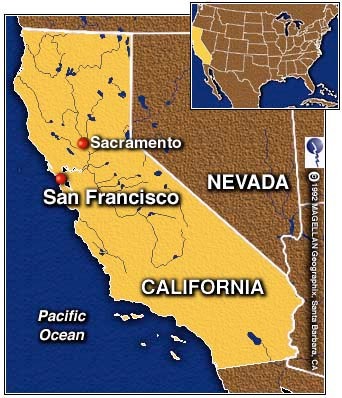 SAN FRANCISCO (CNN) -- In the 1960s, Vozrozhdeniye was merely a tiny island in the vast Aral Sea. Today, with the sea reduced to half its former size, and a much larger Vozrozhdeniye closing in on the shore, some U.S. researchers believe the island is a toxic time bomb set to infect central Asia with some of the deadliest germs on Earth. According to the Monterey Institute of International Studies in California, Vozrozhdeniye was a secret biological weapons test site. Soviet, and later Russian, scientists routinely released deadly agents -- including plague, small pox, tularemia and anthrax -- into the air over the island for much of the last 50 years, the institute claims. "These weapons were extraordinarily potent. Some of them were actually engineered, genetically, to become more lethal than the strains in nature," said the institute's Jonathan Tucker. In 1988, in a hasty effort to bury evidence of its alleged biological warfare program, the Soviet military hauled tons of bleach-soaked anthrax canisters to Vozrozhdeniye, doused them with even more bleach and then dumped them, the institute says. Researchers in Monterey, California say an island in remote Uzbekistan is contaminated with some of the deadliest biological weapons ever developed, and there's concern they may spread. The Monterey Institute claims that anthrax is still simmering in the island's soil. 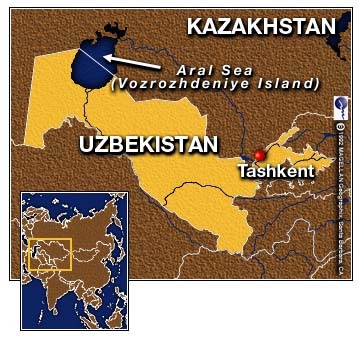 Tucker said that U.S. scientists who took samples from Vozrozhdeniye in 1997 were able to recover viable spores that could be grown in a culture to form live anthrax bacteria. Russia has never acknowledged any role in the anthrax dump. But the institute's allegations are backed by a former top Russian biological researcher. "It is clear, when you destroy tons and tons of their weapons, it wouldn't be possible to kill everything. And now, what we know, is this island is contaminated," said Ken Alibek, who was chief of Russia's biological weapons research and development program before defecting to the United States in 1992. If anthrax spores have survived, it is possible rodents, birds and other wildlife on the island have been infected, researchers said. And because of another environmental disaster, the shrinking of the Aral Sea, the island could be connected to the mainland within a few years. Since 1960, the sea has been systematically reduced because of the diversion of water from two key feeding rivers, the Amu Darya and the Syr Darya, to irrigate nearby crop land. By the late 1980s, the sea had lost more than half the volume of its water and had just slightly more than half its former depth left. With Vozrozhdeniye now expanding toward the shore, scientists fear infected animals could soon spread toxins to neighboring Kazakhstan and Uzbekistan. "This island is definitely a potential time bomb, because the shrinking of the sea and the likely emergence within a few years of a land bridge to the mainland and the possibility that insects and rodents, carrying deadly diseases, could cross over and infect the local population," Tucker said. There may be yet another concern. Alibek said 60,000 to 70,000 scientists, engineers and technicians worked on biological weapons before the break up of the Soviet Union. Where they went or what they're doing now, he says, no one seems to know. Correspondent Don Knapp contributed to this report.